culture and sacrifices of the country’s heroes on its carriages arrived here at the Multan Cantt Railway Station Monday to a warm welcome. flags and chanting slogans of ‘Pakistan Zindabad’ received the train. 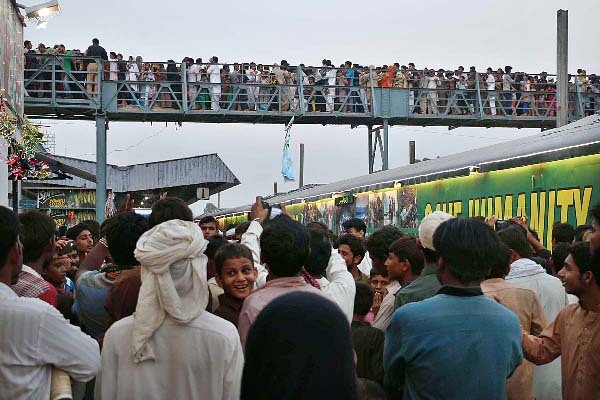 train would stay for two days in Multan to provide an opportunity to the people of Multan to see glimpses of Pakistan’s history and culture, besides heroes of independent movement and wars. the arrival of Azadi Train. Zubair Khan told APP that he had been anxiously waiting for the train for the last 10 days. Ameen, another visitor who was at the station with his family, said the train was beautifully decorated with replicas of historical buildings. Junction, where a large number of people visited it. Folk singers also performed there and got big applause from the visitors, particulary for singing national songs.